Dr Botanicals is a brand that I have seen featured on a lot of my favourite blogs over the last few months so when they got in touch and offered to send me some products to try, I jumped at the chance. They are a London based brand who are cruelty free and use only natural ingredients - no parabens here! 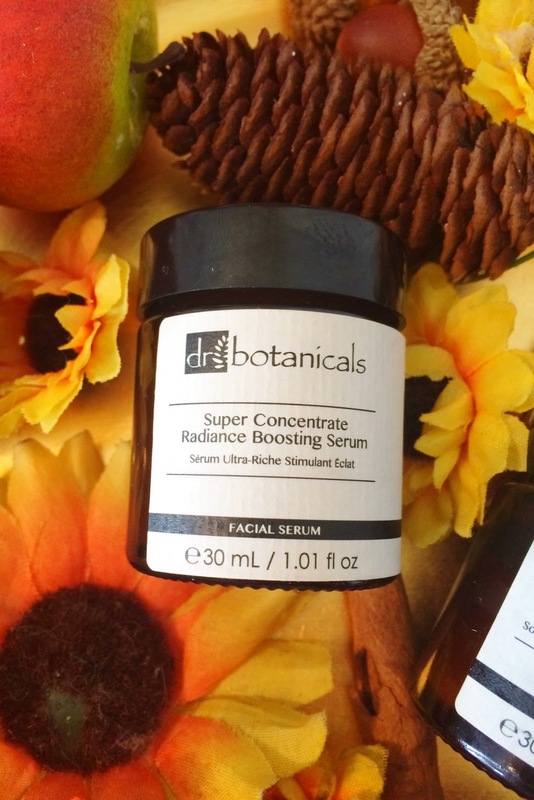 I was kindly sent their Super Concentrate Radiance Boosting Serum and Advanced 8-Hour Overnight Renewal Cream and today I want to share my thoughts with you on both of these products. For reference, I have dry, sensitive skin and am always on the lookout for products that will plump my skin and add radiance. First up is the Super Concentrate Radiance Boosting Serum. This serum contains Blackcurrant Seed Oil, Cherry Kernel Oil and Bisabolol as its active ingredients all of which aim to boost radiance, soothe, nourish and moisturise the skin. The texture is quite gloopy - it is neither runny nor creamy but it absorbs instantly and feels very soothing on the skin - it doesn't feel tacky or greasy and is the perfect product to sandwich my essence and moisturiser together. When I use this, my skin instantly looks plump and perked up - not in the way some serums/moisturisers with a pearlescent finish give, but in a natural, glowing, radiant way. I find that I only need to use a small amount each time so the 30ml pot should last at least 3 months, but I would prefer it to be in a bottle with a pump for hygiene reasons. If you have dull or dry skin, then I would highly recommend using this serum. It is priced at £106.70 on the Dr Botanicals site but I have also found it on Look Fantastic for only £29.99 at the moment. You know I always share any discounts that I can find! 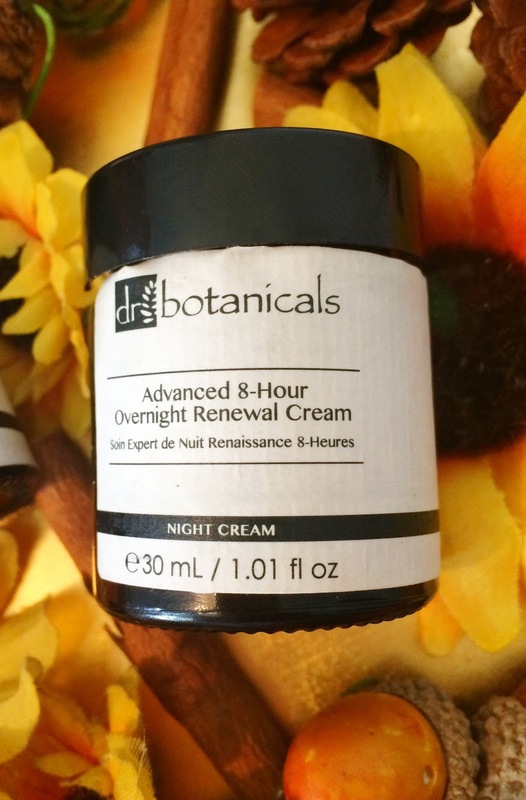 The second product is their Advanced 8-Hour Overnight Renewal Cream, which is my favourite of the two products if I was really pushed to make a choice between them. Although this is called a cream, it is actually a balm and initially I worried about how well this would suit my skin and also about how long the 30ml pot would last because generally moisturisers come in a minimum of a 50ml tub. I need not have worried because I have barely made a dent in the tub despite using it pretty much nightly for the past 6 weeks! This night cream contains Pomegranate Oil, Goji berries and Shea Butter as its active ingredients, all of which aim to repair, protect and renew the skin overnight and I can wholeheartedly say that it lives up to its aims. I only need to use a pea-sized amount of the balm, which I rub between my fingers until it melts down into an oil, which I then massage into my face and neck. My skin drinks this up and although it has an oily texture, it doesn't stick to the pillow or my hair and my skin is so nourished and plumped and looks more youthful due to the diminishing of fine lines. It is a long time since I have been happy with a night cream - usually I favour oils but this does the job of both. 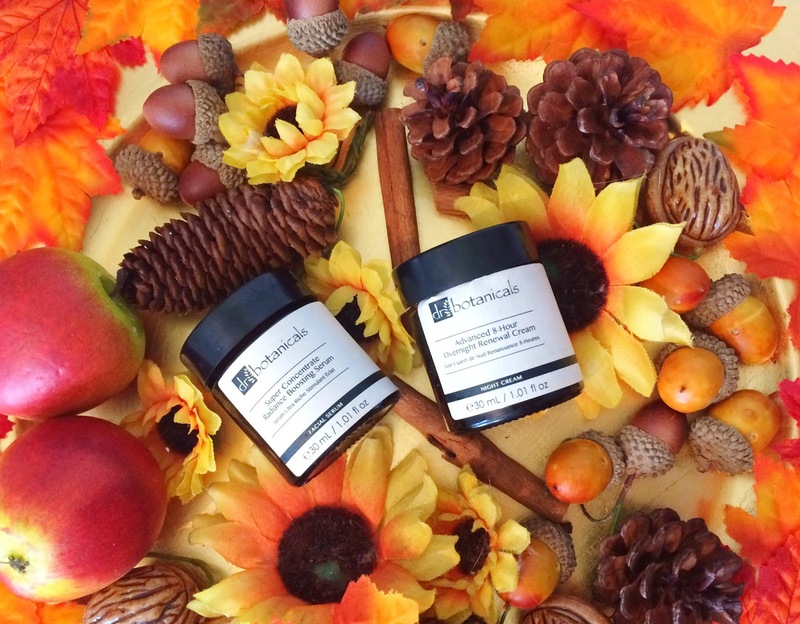 This is literally the perfect night cream for Autumn/Winter for those of us who have dry skin and I know for sure that I will repurchase this when I finish this pot. As you can tell, I am really delighted that I have had the opportunity to try both of these products - they have really impressed me and become firm favourites and I would love to explore the brand more. I would love to hear your thoughts on these products or if you have tried any other products from Dr Botanicals that you think I might like? Please tell me in the comments below!